A preliminary National Transportation Safety Board report estimates last month's CTA crash at O'Hare cost $9.1 million. 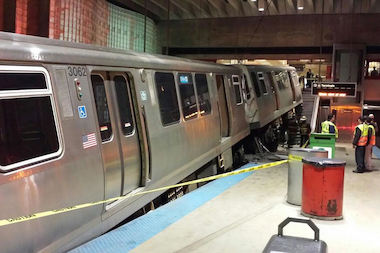 DOWNTOWN — A preliminary federal report issued Monday confirmed a CTA train operator fell asleep before it crashed last month at the O'Hare terminal and estimated the cost of the crash at $9.1 million. According to the National Transportation Safety Board report, the train operator told investigators "she had fallen asleep as her train entered the station." The Chicago Transit Authority Blue Line train was going 26 miles an hour, and the driver awoke as the train crossed a "fixed trip stop" designed to halt the train, but "due to the train speed, the distance from the fixed trip stop to the track bumper post was too short to stop the train." It ran off the tracks and up an escalator, resulting in an estimated $9.1 million in damages, according to the report. The driver and 32 passengers were treated at hospitals, although no one was seriously injured. According to the NTSB report, the driver had worked "nearly 60 hours" the previous seven days and was working her third straight night shift. The train crashed at 2:49 a.m. Monday, March 24, and the driver told investigators she had "inadequate sleep" on Saturday and "felt tired" Sunday evening at the start of her shift. The CTA, which released the driver's schedule showing she worked 55.7 hours that week, moved to fire the driver Friday. "The NTSB preliminary report mentions areas the CTA has already addressed to improve safety," said CTA spokesman Brian Steele, citing how the agency has cut train speeds pulling into the O'Hare station to 15 mph and moved the trip stop back. "Last week, the CTA announced changes to scheduling to help ensure the safest environment for both customers and workers," Steele added. "The changes create some of the most stringent guidelines among U.S. transit agencies, and demonstrate the CTA’s ongoing commitment to safety." Video of the crash surfaced shortly after the accident. The O'Hare station was closed was closed for days before reopening the following weekend.